Nimoy overkill, perhaps? Let’s just get through this one short post today. I’ll get it out of my system, and we can then move on to some other crap. The New World of Leonard Nimoy was Nimoy’s last LP for Dot Records, released in 1970. This was the most difficult of his five LP’s for me to find. It’s more maligned than his others - a good chunk of its songs were included on those bad-celebrity “Golden Throat” compilations. 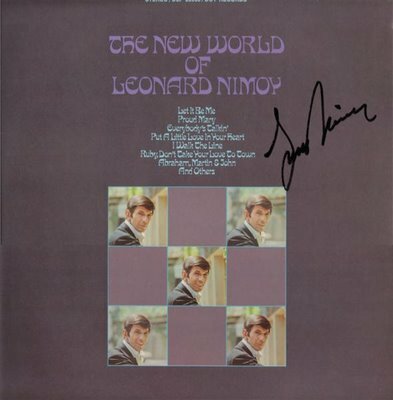 This “new world” of Nimoy’s was a bit country – that’s the style of the arrangements and song selections, with the exception of the sole Nimoy-penned tune, “The Sun Will Rise,” an upbeat hippie folk tune. His vocals may not always be up to the job, but he makes up for it with heartfelt warmth, sincerity and optimism. I know, gay. This entry was posted on Wednesday, October 25, 2006 at 5:01 AM. You can skip to the end and leave a response. I own Nimoy's The Way I Feel. I downloaded the album you previously offered. This is a bridge too far. Now I only need one more song "Time To Get It Together" then I'll have the complete Leonard Nimoy Discography! I find myself in the same predicament, needing only "Time To Get It Together" to complete my Leonard Nimoy discography. Anyone willing to trade this track for ANY other Nimoy track(s)? I'll get the song to you soon, prolly late next week when I'm back from travelling. Much appreciated. I've been collecting Nimoy albums for over a decade, and this last one has always eluded me. ...but I'd sure like to get hold of the track "The Sun Will Rise" from this album. I believe it is one of the few Nimoy actually wrote, and it is important to me for that reason. I'd sure love it if you'd consider re-upping this album or maybe even just this one track! I STRONGLY agree with the comment before this one, about re-uploading this album. Hey, props to 'Dr Forrest's Cheese factory' a blog where I finally requested & received 'The Sun Will rise' posted in answer to a request. If ya like Nimoy;s music, you'll love the Cheeze factory!